There are widely varying opinions on what constitutes a threat to kangaroos in NSW. Let us regard the forests as an inheritance, given to us by nature, but to be wisely used, reverently honoured and carefully maintained. Let us regard the forests as a gift, entrusted to any of us only for transient care, to be surrendered to posterity as an unimpaired property, increased in riches, augmented in blessings, to pass as a sacred patrimony from generation to generation. This possible threat exemplifies the divide between scientific opinion on kangaroos, and how they are faring under the agricultural management priorities which have driven development of the interior of NSW for the last 150 years. This is the “clearing has been good for them” opinion vs the Tasmanian experience of clearing of forests being a primary contributor to loss of 90% of the population of Eastern Grey Kangaroos in Tasmania. In 1974 the Forester, Tasmania’s subspecies of the Eastern Grey Kangaroo (M. giganteus tasmaniensis) made its way onto a list of declining species in Tasmania. In fact it was listed as the second highest priority species of 13 species on this list (Burbridge 1977). Tanner & Hocking (2000) goes on to describe pretty much what this nomination describes as having occurred in Tasmania since the 1820’s (hunting with guns and dogs, poisoning, land clearing, habitat fragmentation and local extinctions), however in Tasmania this resulted in protection for the species, while in NSW new harvest zones are provided to the roo-meat industry. Since the 1970s Tasmania’s natural resource managers have continued to dedicate land for the conservation of the species, centred on Mount William National Park (in which the largest pocket of Greys remained) with additions in the 1970s, 1980s and in 2000. Interestingly they have not proposed clearing to improve habitat, as “researchers” in NSW and elsewhere have suggested has been of immense benefit to the large macropods. So who has it right? Those who declare as if incontrovertible fact, that clearing of native vegetation is beneficial to kangaroos? Or managers in Tassie, who consider that their population is now stable at between 10,000 and 20,000 individuals in a handful of populations, after arresting threats (particularly clearing) to remaining populations, after reporting declines of more than 90%? Indeed ideal habitat for the Eastern Grey Kangaroo remains wooded grasslands, grassy forests and grasslands interspersed with remnants and stands of vegetation - it was not whim that named the Tasmanian subspecies the “Forester”, and the Eastern Grey Kangaroo is colloquially still commonly the “Scrub Kangaroo” (just google “scrub kangaroo”). Coulson (1982) provides a very handy schematic showing road kill locations in relation to types of vegetation adjoining the road reserve (reproduced on pp. 14 of this nomination), showing heavy bias of roadkill occurring in proximity to woodland and open forest units. Similarly Western Grey Kangaroos like mulga and Bimble-box woodlands, and spinifex with stands of trees (in which you find their scrapes). The Wallaroo (sometimes the “Hill Kangaroo”) stronghold remains wooded hills and steeper rocky country (which remains largely timbered); and while Red Kangaroos like open clay flats and floodplains, you usually see them during the day lying around in the shade in stands of timber, under isolated trees and in floodplain-fringing vegetation. Simply put CLEARING OF NATIVE VEGETATION was listed as a KEY THREATENING PROCESS in NSW under the TSCA 1995 (NSW Scientific Committee 2001). Just because kangaroos are not listed under Appendix 1 of the FINAL DETERMINATION does not mean they are not affected; it just means that no-one has yet established a link between clearing and declining kangaroo populations, or identified kangaroos as being threatened by this process. This nomination (and the case with the Forester in Tasmania) suggests this link. However remnants often occur as single trees or small groups of mature or senescent trees; these stands typically have little, if any, of the original understorey species or structure, have no regeneration, and have essentially ceased to exist as functional ecosystems. “Improving” land by removing trees is actually directly removing cover which is critical for all of the large macropods. Montague-Drake (2004) and Croft et al (2007) identified preferred grazing and resting locations as being habitat components determining kangaroo distribution, even more-so than watering points. As far back as 1965 it was recognised that cover was a key habitat attribute - how has this been overlooked or forgotten ever since, in the discussion of how clearing has supposedly improved habitat values for the large macropods? The situation with lost and diminishing habitat for kangaroos is not likely to improve. Scrubby vegetation in regenerating areas is referred to widely as “woody weeds”, and the authorities have invented a term to describe this phenomenon of regenerating landscapes: “Invasive Native Scrub”. Clearing of “woody weeds” remains the most common “justification” for clearing applications; NSW CMAs even have a fact sheet about “managing” the “thickening and encroaching native trees and shrubs” (CWCMA 2007). Clearing at a small scale occurs with every development application and public work, and under the auspices of “clearing approvals”, and illegal and unauthorised clearing continues (the picture below is from Palmers Oakey, adjoining Winburndale Nature Reserve – no action was taken). Further, now enshrined in legislation is “biobanking”, and “offsetting”, a form of creative accounting with trees, which nonetheless results in net loss. Only the most damaging proposals go down this road, as they are necessarily going to destroy a shipload of vegetation (look at Boggabri coal proposal, for example). Biobanking “provides certainty” for development consent, rather than treading the precarious tightrope of uncertainty, upon which threatened and other native species find themselves. Nothing is slowing the widespread clearing of native vegetation in NSW at this stage – how does it affect the large macropods? Principally by increasing exposure to “predation” (mostly by humans, sometimes called shooting). Kangaroos sheltering in small stands make off in haste when approached for a reason (if they can negotiate the fences); not doing so risks being shot – small isolated stands are not effective refugia for kangaroos (pers obs). Clearing has been widespread throughout the landscapes of NSW - the only significant refuges for kangaroos in NSW now lie in large remnant areas, which are few and far between; remnants are generally small and scattered fragments (see above). 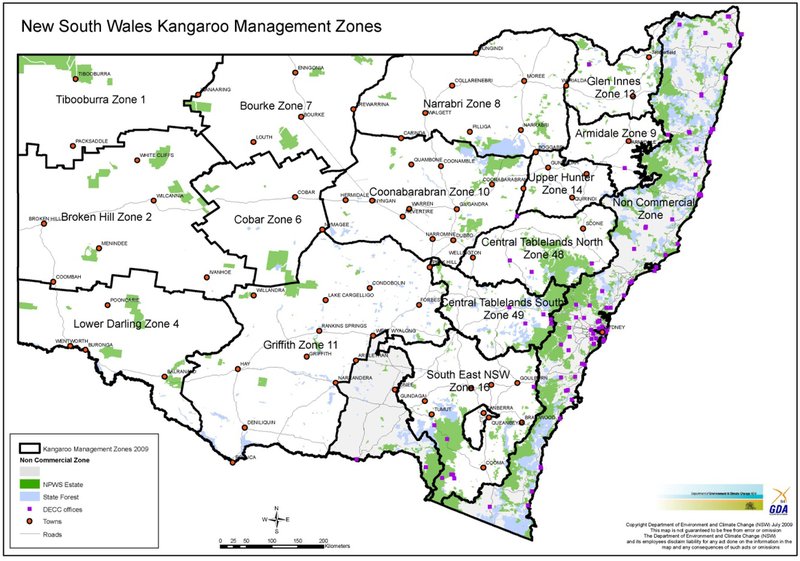 Dedicated conservation areas account for only 7% of the western zones, private properties managed for conservation (Voluntary Conservation Agreements / Nature Refuges etc) are not expected to provide a significant proportion of land use through the kangaroo harvest zones. 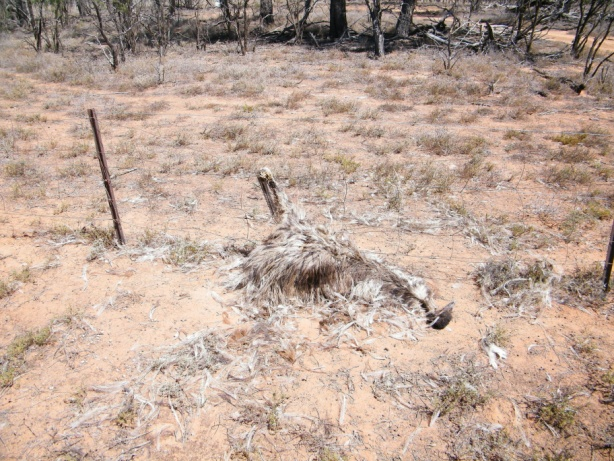 Unfortunately for kangaroos, the larger remnants are often associated with poor soils and terrain incompatible with agriculture (Howling 1997). These units provide a cline in which optimal habitat for the Eastern and Western Grey Kangaroos occurs around the foot of and lower slope, with Wallaroos often on the steeper slopes and ridges. These types of refugia may then protect Wallaroos quite effectively, however dispersal for this species will remain a major problem – as a wild-life worker and rescuer, young (dispersing) male Wallaroos provide a disproportionately high frequency as the most commonly encountered large macropod in backyards in Bathurst (pers obs 2008-2011). But Eastern and Western Grey Kangaroos may not be so well protected in these remnants. Occupying the lower slopes, and often adjoining farmland, the grey kangaroos will forage away from the forest edge of large remnants (such as national parks and nature reserves) entering properties where farmers frequently patrol boundaries, occupiers licence and tags in hand (or not, as the case may be), gun on the passenger seat. They “hate” kangaroos “more than badgers” (wombats), and they hate the NPWS who “breed ‘em”. The Forester is no longer listed as ENDANGERED in Tasmania; in 2007 the Minister for the Environment & Heritage (Commonwealth) was advised by the Threatened Species Scientific Committee that the Forester did not meet criteria to be listed under schedules of the Commonwealth Environment Protection & Biodiversity Conservation Act 1999. 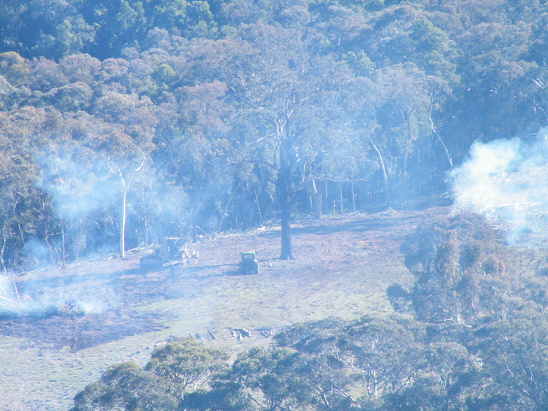 Continuing “conflict” with landholders provides that DIPW (Tas) allows shooting of 660 animals per annum (between 3-6% of the total estimated population). Animal rights campaigners claim figures are being shot far in excess of this (Nikki Sutterby of the Australian Society for Kangaroos pers comm 2010). Habitat modification, particularly that associated with grazing, has generally improved conditions for kangaroos (Executive Summary; pp 7). Also kangaroos “benefit” from “landscape changes producing more grasses and annual forbs” (Olsen & Low 2006 again). I cannot speak too highly of the Country, the increase in stock for 100 years or more cannot overrun it. 4th May …The appearance of Bathurst Plains from the Depot extending for many miles on both sides of the Macquarie River, and surrounded at a distance by fine verdant hills, is truly grand, beautiful and interesting, forming one of the finest landscapes I ever saw in any Country I have yet visited. The soil is uncommonly good and fertile, fit for every purpose of cultivation and Pasture, being extremely well watered, and thinly wooded. 9th May …The Country between Bathurst and Mount Pleasant for five miles is one continued Plain of fine rich fertile Land, with beautiful verdant low wooded Hills skirting it…a beautiful rich Valley extending from Mt Pleasant in a South West direction for about 8 or 9 miles… very fertile and well watered, having fine verdant hills…a very fine extensive prospect. The cattle would be refreshed by a weeks rest in the midst of the rich pasture around us. 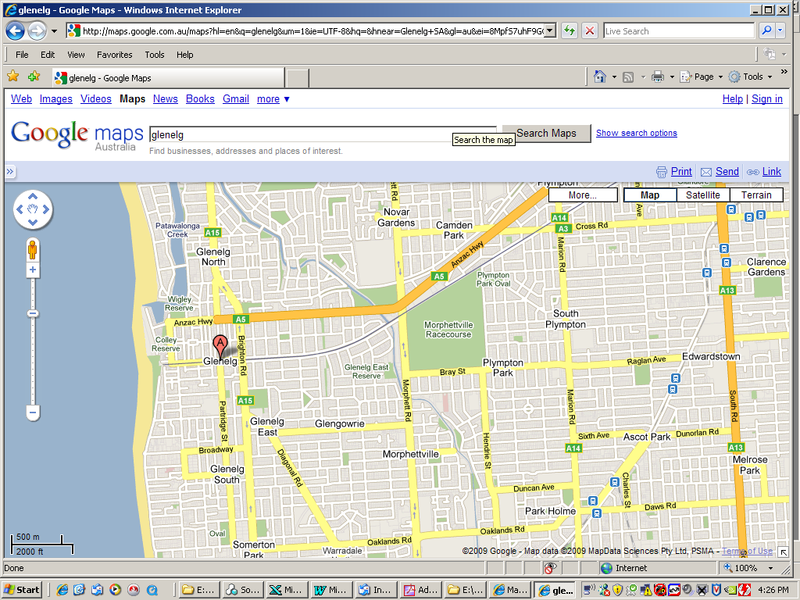 This area is now Adelaide. Interestingly: kangaroos actually evolved in Australia! It is difficult to understand how wildlife ecologists could suggest that introduced species in the groundcover (clovers, rye grasses etc – the “improvement” agriculturalists refer to) could be beneficial to any Australian fauna. “Perfect” conditions for these animals occurred across the whole of Australia 200 years ago – Gammage (2011) describes a fertile landscape or grassy plains and forests, with deep friable topsoil, ecosystems abundant and diverse with wildlife, well buffered against drought; clearing of the mallee sent the topsoil to New Zealand (pp 116), and the function and resilience of the landscape is now heavily impaired. Refer also to Gammage (2011). It is the author’s view that these grassy situations are more likely to have been in an optimal proportion to forest and woodland cover, as this arrangement pertained to kangaroos as habitat, formerly under the management of the Aborigines, rather than presently. In fact and contrary to Heywood’s position, the NSW Scientific Committee have listed Invasion of native plant communities by exotic perennial grasses as a KEY THREATENING PROCESS in NSW under the NSW TSCA 1995 (2003). This listing does not discuss the process’ effect on kangaroos, but it may be that given Heywood’s conclusions (above), and recommendations that “adaptive kangaroo management” seek to control kangaroos by modifying and manipulating groundcovers, kangaroos too will be affected by this KTP. Impacts of stock around water points is well documented, with species palatable to stock and kangaroos being removed to distances of 1km (the “piosphere”), with the worst affected area (200-300m in Sturt National Park) being described as “the sacrifice zone” (Croft et al 2007). This is taken to mean that this area has no habitat value for anything, really, and habitat / vegetation values improve in proportion to distance from the water point. This applies to dams, as well as natural areas holding water, including creeks with water holes and standing pools, gilgais etc. Cattle tread pooled water and vegetation to a muddy mess. Stock are well known to congregate and concentrate around water points, however kangaroos have been determined to not have a water-focused grazing pattern (Montague-Drake 2004). James (1998) provides quite a bit of detail about impacts on the piosphere (the region around a water point) – impacts of stock (denuding of vegetation, compaction, mechanical erosion etc) are severe, and are still evident 20 years after removal of stock. In fact, it may be appropriate to include dam piospheres in the “kangaroo excluded” areas discussed in the section of this nomination discussing “lost” habitat (above), as the inner piosphere (the heavily degraded area), can become completely denuded of vegetation, having no forage or habitat value whatsoever, for anything. White men had established a cattle station nearby having followed the exploring parties tracks over the mountains. A random selection of maps from central and western NSW (in each KMZ) have been randomly sampled (based on ten 10x10km quadrats), with the Table below providing data on the number of tanks / dams / bores illustrated on the topographic map (note that not all water points are likely to have been illustrated on topographic maps). Far western KMZ’s (1, 2, 4, 6 and 7) seem to have fewer water points than central-western locations (KMZ 8 and KMZ 10). Areas of the Riverina have relatively high densities of artificial water points, possibly on account of associated irrigation activities (KMZ 11). Note that every single 10x10km area in which water points were summed also included features named as “creeks”, “rivers”, “swamps” and / or “water holes” (see dams_calc.xls file which informed this nomination). Multiplying water point densities by the area of the zone gives an approximation of the number of water points in each KMZ. Multiplying the number of water points by лr² provides an estimate of the area of western NSW which has been “sacrificed” in order to water stock For the purposes of this nomination “r” (radius) has been given as 300m in far western zones (KMZ1, KMZ2 and KMZ4), 200m in KMZ6 and KMZ7, and 100m in central-western zones (KMZ8, KMZ10 and KMZ11) to reflect increasing aridity to the westward, and to give a conservative estimate (not all dam environs will be destroyed for the full 300m radius). So instead of deep clear pools every 10-20 miles or so, overhung with verdant greenery (as described by Mitchell 1831-1839), we have something like 6,000km² of devastated “sacrifice” zone in western NSW, surrounded by fences, frequented by stock and feral animals, and denuded of vegetation. Note that the “sacrificed” area will often overlap with the “vegetation cleared” polygons of habitat modification (destruction), so this nomination is not suggesting the adding of destroyed peizospheres to the lost habitat due to clearing of native vegetation. However the dams / km² estimate above provides that of the 7% of the western zone that is reserved land something like 420km² may also have been severely affected by stock, if their historic use had included grazing (from Croft et al 2007). There is a second part to this factor – water consumption. Mitchell (1831-1839) describes often enough camping at fine, clear, verdant pools, overhung with vegetation. Leaving aside the fact that the cows and sheep probably ate all the greenery, and trod the hole into a muddy mess – how much did they drink? Mitchell’s party included 20 or so men and teams of cattle to pull the wagons, but also in the later trips a flock of sheep (as walking provisions) – this would have resulted in a fair bit of water being lost at each camp site. Once the settlers arrived, the sheep and cattle were there permanently, and water sources would certainly have been increasingly depleted (and polluted) until the water requirements of stock, particularly in times of drought, caused entire regions to be completely robbed of all water, no doubt to the detriment of the local kangaroos, as well as the stock. People in the cities see only the images of dust and bones in the news, or animals stuck and struggling or dead in muddy holes. NPWS have devised and are enacting a policy on the closure of water points within service managed areas (NPWS undated). 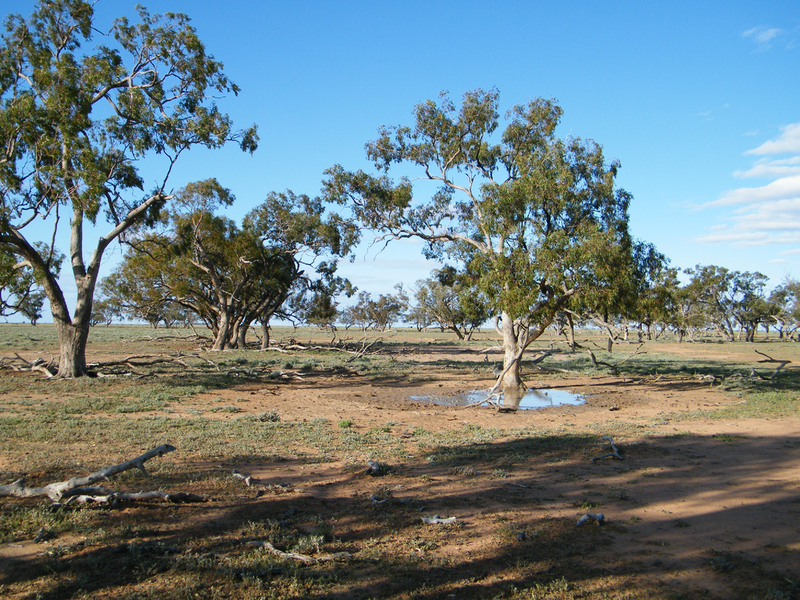 In a landscape where springs have ceased to flow on account of reduced pressure in the Great Artesian Basin, where rivers often run dry as irrigators pump water to their crops, where creeks and water holes have been depleted and trodden to a muddy mess by stock, and where farmers enact severe control measures against kangaroos coming to “their” water, NPWS are implementing a policy to remove “artificial” water sources from within the system of conservation reserves. 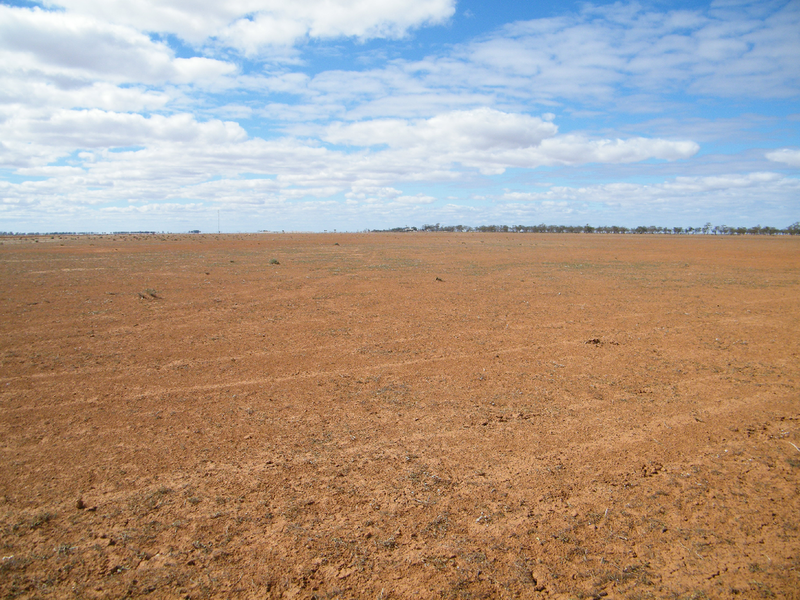 The land which represents the only refuge for the large macropods throughout much of central and western NSW, the nature reserves and national parks, are having the only remaining water points systematically “turned off”, as managers cleverly identify that these few remaining water points create and maintain an artificial situation, which is completely unacceptable. It is acceptable for a longwall mining or CSG company to crack aquifers, drain swamps and wetlands and otherwise deplete or pollute groundwater (the OEH takes no action when this occurs – in fact they hand out the approvals). What is unacceptable to the OEH is native animals being able to drink safely, without fear of being shot or being caught in fences, within a notional conservation reserve. This is something that the department will actually do something about, by decommissioning “artificial” watering points; levelling dams, turning off bores and injecting concrete into leaking ones, dismantling and removing tanks, troughs and pipelines, etc. It does not matter that during the last 150 years these watering points have sustained wildlife in a landscape where “natural” water points have often been destroyed, degraded, depleted or simply denied to wildlife. Even in their last havens – the national parks and reserves of western NSW, the agency charged with their protection are doing everything they can to render their few remaining water sources defunct in an attempt to “restore” the landscape. …evidence presented… suggests that exclusion of kangaroos from water may not achieve significant improvement in vegetation…Nonetheless NPWS proceed with the enactment of their policy. This may be another nail in the kangaroo coffin, as the kangaroos of the waterless parks will be forced to negotiate the fences, and enter farmlands to visit water, being there subject to the control measures the farmers have traditionally brought against them. In fact McLeod (2003) discusses closure of artificial water points in the national parks as something that will “increase the effectiveness of harvest”. Great, that’s just what’s needed, more “effective” harvesting. Once again there are completely opposite conclusions about kangaroo / stock competition in the published research. Conclusion 1. Some researchers have determined that kangaroos prefer different foraging conditions to stock and they don’t compete, or kangaroos compete with stock “only when TGP exceeds dry matter production” (eg: Temby 2003) and; “competition is no longer a justification for culling animals” (Olsen & Low 2006). Conclusion 2. A wider understanding of ecology provides that there are simple carrying capacity equations based on things like trophic levels and Total Grazing Pressure, which allocates biomass to the various layers of consumer organisms (each trophic level is roughly 10% of the biomass of the preceding level), and equivalence to herbivore species (like the Dry Sheep Equivalence, or “DSE”). “Carrying capacity” can be “calculated” (that should read “estimated”) for any species in a given environment, with a limit to the number of organisms within each trophic level. This sort of thinking indicates there is a very basic competition for feed within (for example) the “herbivores”. These two views on stock / kangaroo grazing interactions cannot both be true. Cows alone presently equal kangaroos in simple abundance in harvest zones across Australia (26,550,000, according to MLA 2010), while they eat up to 50x more than does a kangaroo (based on a cow average DSE of 10, and Grigg’s kangaroo DSE of 0.2). There are generally over 100M sheep in Australia. Feral goat numbers in NSW were calculated in the table above as being 25% of the total Australian population (estimated at 2,600,000 in 1996, according to DEWHA 2004), given that NSW represents roughly one quarter of the area occupied by feral goats in Australia (Reddiex & Forsyth 2004 / DEWHA 2004). Note that DEWHA in 2004 quoting figures for numbers of feral goats in Australia from 8 years previous is very poor, considering also that there is an export market of 1.4M head / annum (MLA 2009). The 650,000 goats in NSW in the table above is likely to be extremely conservative (100,000+ goats from NSW are included in the export market annually – ABS 2008). More realistic estimates of goats in western NSW will be based on an average goat density in eastern SA (assumed to be comparable to goat densities in far western NSW), of 5 goats / km² (DEWHA 2008). Application of this density across the commercial kangaroo harvest zone area of 656 907 km², and “protected” conservation areas within the KHZ (c. 50,000 km²), provides there may be as many as 3.5M feral goats in western NSW. At a kangaroo DSE of 0.2, this would displace 17.5M kangaroos, instead of the 3.25M in the table above. However average goat density increases in the east of NSW to between 26 and 98 goats / km² (Fleming 2004). This being the case the estimate of 3.5M feral goats above should be considered to be at the lower end of an estimate of feral goat numbers in NSW. There were 300,000 feral horses across Australia according to Bomford & O’Brien in 1993, however this was revised upwards when aerial counts in the NT determined there were 238,000 in the NT alone (discussed in Symanski 1994). Today the DSEWPC (2011) provides there are 400,000 nationally, and “millions” of asses. Note also that numbers of other exotic and feral herbivore species, including rabbits, deer and camels also occur throughout the ranges of the large macropods. These species contribution to TGP, and equivalent (displaced) kangaroo numbers which may be attributable to the rise of these species, are not included in the table above. This means the total grazing pressure being applied throughout NSW by domestic animals (and feral goats and other exotic species), is equivalent to the pressure of roughly 500M kangaroos. Discussion about the competing species (stock vs kangaroos) favouring different groundcover compositions and arrangements, and preferring various foraging situations, is moot, as 93% of the kangaroos former habitat had been taken over by (or has been totally modified by) agriculture (see Figure 15). This nomination is not suggesting there were 500M kangaroos prior to European settlement in Australia; it is suggesting that the grazing pressure of more than 500M kangaroo equivalents has changed the landscape from the verdant vales and rich grasslands described by Mitchell and his peers, to the over-grazed landscapes we see today. Grazing by 500M kangaroo equivalents may have placed more than double the historic grazing pressure on ecosystems (based on this nomination's suggested 220M kangaroos, prior to the advent of white man and farming in NSW). This damage has been done by sheep, and was typical of many landscapes throughout central and western NSW in 2009. Refer to any photos of ruins in western NSW – these former houses would have been built in surroundings pleasing to the new owners – they did not build in a barren hostile place. The degradation of the landscape by clearing and overstocking is well documented as the cause for the subsequent abandonment of land “marginal” for farming. The damage is still evident more than 100 years later. The pool was shoulder to shoulder with them when he switched on the spot. They went rigid and opened their eyes to him. Quick worked from left to right without haste. Shoot, load, aim, shoot. The roos stood there, unwillingly, but unable to tear themselves away. Their necks curved richly, their ears stood twitching. Haunches ticked with muscle and nerve. The sound of the Lee-Enfield was honest and uncomplicated, always leaving enough space in the air for the sound of the bolt clicking in a new shell, as the roos fell, snouts flicking up like backhanded drunks. When finally the survivors began to stagger away, Quick took fast shots, moving the spot with his elbow, until he was taking them down in their stride. And then his sighting eye gave out into a watery blur so that he had to rest. Around the pool the fallen animals lay like a new stone formation, the colour of granite. Some heaved with breath or blood. Even with the whine of sound shock in his ears, Quick could hear the scratching of paws in the sand. Water-hole hunting is a well known tactic used by predators, not only by humans (including kangaroo shooters and Tarzan), but also by the big cats, and dingos. There was a theory that the megafauna were hunted to extinction by aborigines, by being ambushed at waterholes. This theory has been largely debunked on account of low Aboriginal population densities at the time, and their use of low-tech weapons. However the theory that a focused and effective hunting technique (waterhole hunting), conducted with high tech weapons (high powered and repeating rifles) and spotlights (as described by Winton above), could potentially have a significant impact on kangaroo populations over time, has not been tested. To this day farmers continue to actively shoot kangaroos, both via the OEH-NPWS permit system (KMAP minutes March 2008 suggest non-commercial shooting in the harvest zones averages around 5% of the kangaroo population per annum) and illegally. “Shooters” come to the country to shoot, often native Australian wildlife, often illegally, sometimes “whatever”. Don’t kid yourself that because you never hear about NPWS prosecuting someone for illegally shooting kangaroos, that it doesn’t happen. The NPWS do not police shooting in rural regions, and they do not investigate or prosecute reports of illegal shooting (this view is based on the author's personal experience). In addition we have a commercial harvest industry worth $270M (according to Kelly 2008), which presently accounts for approximately 1M animals in NSW per annum (3M Australia-wide). This industry actively promotes itself, and is expected to vigorously or even aggressively oppose this nomination, rather than entering into the spirit of stimulated “discussion” encouraged by Grigg (2002). What is the story with Wagga-Wagga? This non-commercial zone is “optimal” habitat for kangaroos according to the descriptions we hear (cleared, improved grasslands, given to agriculture), but for whatever reason this zone is not included in the harvest. It seems likely that the reason this region is not included in the harvest, is because there are not enough kangaroos left there for viable / profitable harvest operations. The author would welcome clarification on this situation from the OEH / KMAP. This nomination has elsewhere detailed the trend in kangaroo populations, and suggests that shooting of animals, including commercial harvesting, shooting under s. 120 and 121 licence, and illegal shooting, is playing no small part in the decline of the large macropods. This position is not supported by the published research, however. The status of 50 species of macropod was summarised by Calaby & Grigg 1989, this was reproduced by Pople and Grigg in 1999 in Commercial Harvesting of Kangaroos in Australia. Interestingly the “causes for decline” are attributed variously as “rainforest clearing” “clearing of east coast forests”, “possibly threatened by wood pulp industry”, “land clearing”, “impacts of grazing animals”, “fox predation”, “habitat change”, “rabbits”, “cats”, “grazing”, “the pastoral industry”, “goats”, “changed fire regimes”, “farming” etc. There is a single species, the extinct Toolache Wallaby, which was driven to extinction by “hunting” and “coursing” (killing with dogs). Calaby & Grigg do not mention shooting as something affecting macropods in any sense other than for the extinct Toolache Wallaby. Nor do they consider poisoning and 3,000,000 bounties being paid for bettongs and potoroos between 1880 and 1920 (according to the DSEWPC Sprat file for the Potoroo, 2011) as contributing to their decline (3 of the five species formerly in NSW are now extinct), preferring an interpretation that it was the fox, which arrived at around the same time as their populations collapse. Perhaps it was a combination of poisoning / shooting / hunting / trapping and foxes? The whole concept of extinction is that multiple deleterious processes may be playing a part at any one time, and they all contribute to declines. This possibility was not discussed by Calaby and Grigg. Nor does Calaby and Grigg (1989) mention 640,000 bounties paid for Brush-tailed Rock Wallabies between 1884 and 1914 (this species is presently listed as VULNERABLE in NSW, and it is illegal to shoot them). Interestingly it is the commercially shot species which seem to be thriving under present management systems. Kangaroos have “benefited” from development of land for agriculture, while every other species is, if not extinct, in severe decline, from the exact same processes. To finish: Jonathan’s T-Shirt (yellow / black kangaroo advisory sign with text “next round” instead of “next 15kms”) says everything that needs to be said about many people’s attitude to kangaroos in Australia. Fences ensnare animals daily. 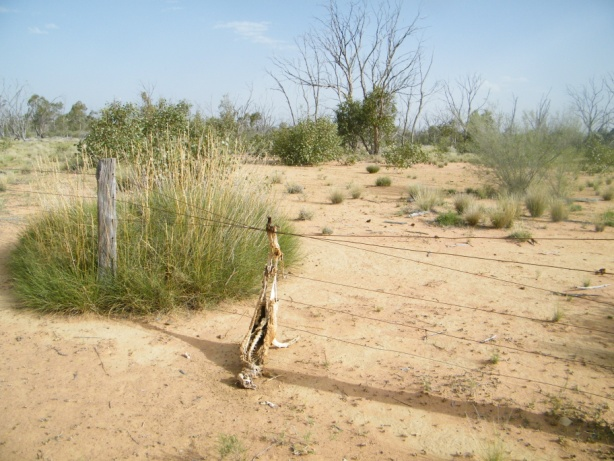 2km of “new” fence in Ledknapper Nature Reserve north of Bourke shows evidence of the demise of 12 animals (Mjadwesch 2010). Even thought it's 6:00am, this animal is beyond recovery without 6 months of rehabilitation. Musculature of the legs will be torn, joints are over-extended, its arm is broken and there will be circulation problems. Animals in fences can often break their legs, their necks and/or their backs. Anywhere wires are twisted together count one dead kangaroo (or emu). Plain wire also catches animals, however the wires un-twist once the bones of the animal fall out. How many kilometres of fence are there in NSW? They proliferate with every rural residential development (subdivision). Catchment Management Authorities roll out fencing programs for “conservation” projects (for example stock exclusion from remnants, streams etc) – the “Water and Wire” package through the CWCMA provided hundreds of kilometres of brand new fencing in the Central West CMA alone. 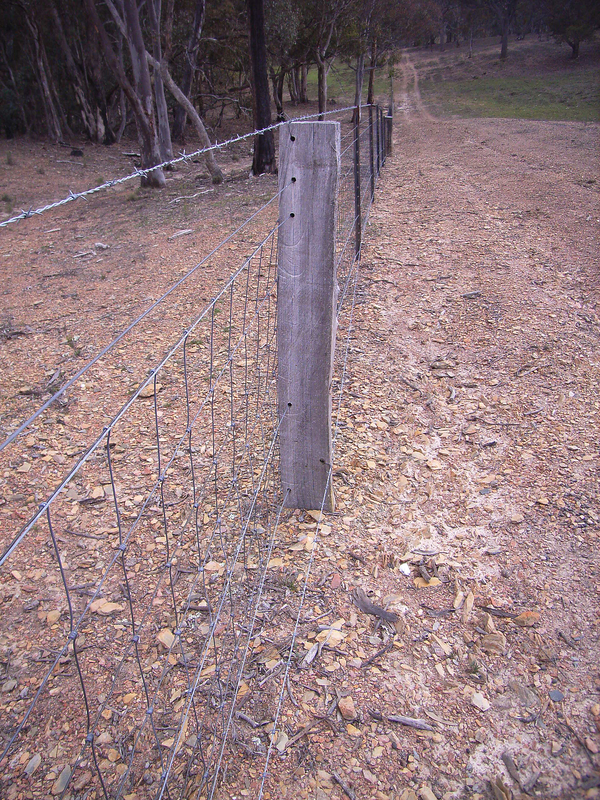 Not a single kilometre of this fencing was “friendly” to fauna (all barbed and mesh? No response to this query from the CWCMA). 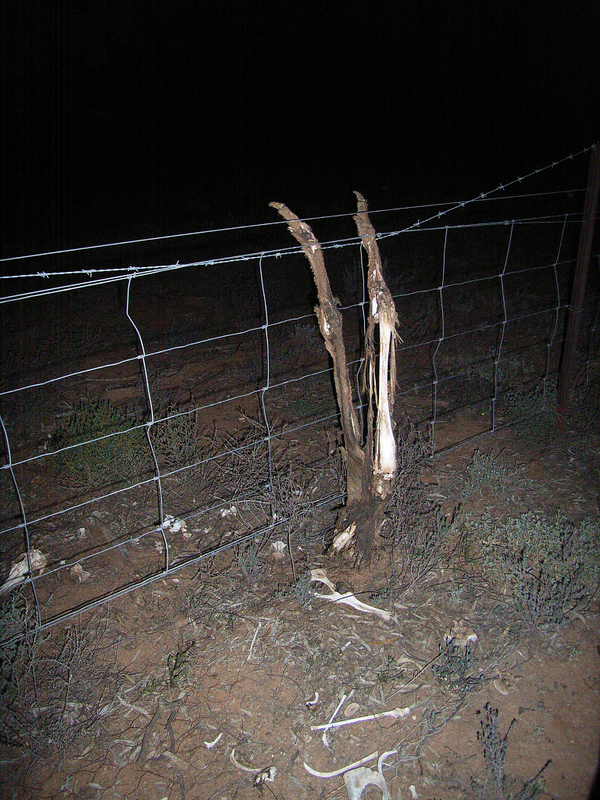 The standard rural fence suggests even a deliberate design on behalf of farmers, with the intention to ensnare kangaroos. Fences continue to kill animals for many years (see Figures 20 and 21). Where animals are able to struggle free of a fence, they are often still so badly injured they cannot survive without intervention and care. In addition fences break up mobs and family groups. The author has observed at-foot joeys becoming separated from their mothers at fences, particularly where finer meshes such as chicken wire have been used; larger mesh can entangle and injure joeys when they attempt to get through the mesh. New fences can be almost impossible to negotiate safely - this one has off-set barbed wire at the top and bottom. 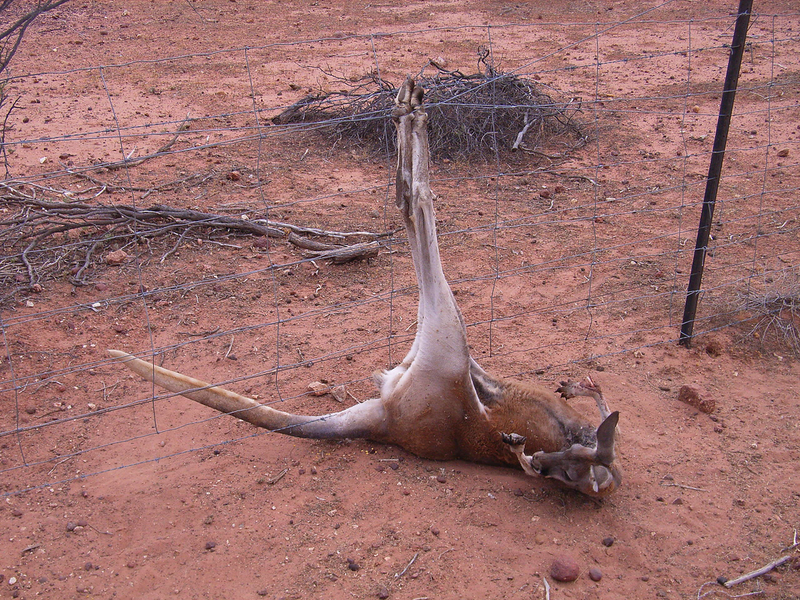 Many species besides kangaroos are also affected by fences. The author’s own personal observations as a wildlife rescuer have included many Eastern Grey Kangaroos, as well as Powerful Owl, Southern Boobook, Wedge-tailed Eagle, Grey-headed Flying Foxes, Frogmouths, Gliders, Parrots, Tortoises and many other species besides. I am sure WIRES and similar wildlife carer organisations could give the Committee an extensive list of species which have been found caught / killed / injured in fences. Fences would account for many thousands of native fauna fatalities annually. On this basis proliferation of fences itself may be eligible to be listed as a KEY THREATENING PROCESS in NSW. Fence building is often aggressively unfriendly to fauna, it is completely unregulated, it occurs with every rural residential subdivision, and for the most part is completely uninformed, even when undertaken on behalf of groups ostensibly focused on conservation. There are 340,000 kms of sealed road in Australia (Sydney Morning Herald 5th February 2010); Hacker et al 2004 provides a figure showing “roads and tracks” (which will include unsealed and unformed roads) in the Murray-Darling Basin in western NSW (pp 27): the thickness of the lines means that their study region (including most of western NSW) is almost completely coloured. Traffic on roads kills animals every day. Frequency of road kill will be directly proportional to densities of kangaroos, and the number and type of traffic movements daily. An unpublished study of road kill during 1980 was reported in Short & Grigg (1982) as 16.7 kills / 100km in pastoral regions, and 1.6 / 100km in regions dominated by wheat farming (illustrating also something of kangaroo densities in regions subject to different land use). Again in Victoria Coulson (1982) reported macropod roadkill (Swamp Wallabies and Eastern Grey Kangaroos) along 100km of the Northern Highway between Melbourne and Echuca. 37 Eastern Grey Kangaroos were killed over a 5 year period, kangaroo warning signs did not make a difference to the frequency of collisions. Note that Short and Grigg (1982) reported Eastern Grey Kangaroo densities in this area was only 0.27 kangaroos / km² (± 0.25) at the time – quasi-extinct, according to Hacker et al 2004. Animals, particularly kangaroos, are the cause of around 23 NSW collisions a day, according to NRMA Insurance claims data. NRMA go on to cite 6,371 kangaroo collisions occurred in NSW in 2008. Roads and roadkill are a constant sink for kangaroos. It doesn’t matter if there is harvest, drought, clearing or development going on, roads are a constant, and there is no recovery for most animals struck by a vehicle (a large part of the author’s “rescue” work with wildlife revolves around euthanasia of macropods on roadsides in the Bathurst region). Roads are a well known factor impacting on many wildlife values, and many species. The author’s own collection includes a roadkill Koala, Little Eagle, Powerful Owl, Diamond Firetail, Rosenbergs Goanna, and Superb Parrot – all species already listed as threatened under the NSW TSCA 1995. There will be thousands of examples of species and populations affected by roads, and the expansion, extension and consolidation (including widening, sealing and construction of extra lanes) of the road network. It is surprising that roads are not already listed as a KTP, given their well documented impacts not only directly causing the deaths of thousands of animals annually (both as they are built with removal of habitat, and with vehicle collisions with animals), but also their contributions to clearing of native vegetation, being also a major contributory process to fragmentation of habitats, and well understood as vectors for weed dispersal (Darwin himself noted this during his travels in South America). The author does not have time to make a major case for this proposed KTP listing, suggesting instead it is the job of environmental agencies to identify and address major processes impacting on natural / environmental / threatened species values. Tidbinbilla Nature Reserve in the ACT – was this enclosed land? Between 1996 and 1997 high densities of kangaroos (357-367 kangaroos/ km ²) had apparently denuded vegetation to such an extent that high numbers of joeys were reported as having starved / died subsequently, from malnutrition. The solution is generally the rather unimaginative (but cheap and easy) option: shoot the animals, even in the face of scientific and/or domestic and international community opposition. This effectively “reduces” populations. These populations can often only be described as isolated kangaroo populations: “reduced” populations may be more susceptible to local extinctions, via stochastic catastrophic events. Anthropogenic climate change is listed as a KEY THREATENING PROCESS in NSW (NSW Scientific Committee 2000). The juvenile kangaroo respiratory system must work considerably harder than that of adult animals to maintain heat balance. Overall, juvenile kangaroos appear more sensitive to extreme conditions, not only with respect to long term stresses, such as food limitation (Munn & Dawson 2006), but also to short term extremes, such as severe cold or heat. It is therefore important that these facets of juvenile mammal physiology be taken into account when considering the possible impacts of climate change. Forecast for Australia? Hotter, colder, wetter, drier (ie: more extreme). Kangaroos, particularly juveniles, will be susceptible to impacts of climate change. DEC will develop a strategy for dealing with epidemic mortality events of kangaroo following a “big wet”. What are the causes of epidemic mortality and what are the implications for kangaroo harvesting and human health? The conditions that occurred in previous years to produce epidemic mortality are now prevalent again. There are huge surface areas of water and large rainfall on top of this. There is no response strategy in place should this happen. Does anyone else think it’s a bit strange that the Kangaroo Management Advisory Panel don’t seem to be interested in the impacts of these episodic dying off events impacts on kangaroos? They seem more interested in the implications for the harvest industry, possibly because this is how they are funded (revenue from tags). Again the KMAP’s performance in not ensuring that this risk is analysed and addressed is astonishing, and this provides a lovely introduction to the final threat discussed here. 5.12 Regulators Asleep at the Wheel - is this an Additional Threat? The fact that this nomination can be written, and that all those trendlines in KMZ populations and “take” (above) may have come as a surprise to the regulators, suggests that the regulators may be asleep at the wheel. Having wildlife managers in a state of catharsis, while populations crash, suggests that the manager’s negligence and inferred incompetence are themselves factors which threaten the long term survival of the large macropods in the wild. One harvesters’ licence was cancelled in 2009 following repeated failure to comply with licence conditions despite two successful prosecutions and one infringement notice. The harvester lodged an appeal with the Minister for the Environment, who determined that the licence would be reinstated. This says a lot about the capacity of regulators and wildlife managers to enact their legislation and policy. The KMAP minutes contain a host of problems the department has experienced with shooters, including forged signatures, submitting false information, shooting on unauthorised properties, shooting wrong species, shooting animals in the body, shooting animals in suspended harvest zones and appending tags to animals from other zones, incorrectly and not submitted harvester return forms, exceed number authorised etc, as well as a general unco-operativeness, surliness, and even hostility towards regulation. You would think that industries operating in such a casual manner would be shut down, but like with the mining industry (with hundreds of breaches annually), nothing happens. Is there a point to having a NPWS and an EPA, when all they seem to do is facilitate development, and watch the worst behaviour by recalcitrant licensees and developers? If this process affects 2 or more threatened species (Criterion 1), or if the process can cause presently un-listed species to become listed (Criterion 2), the NPWS being asleep at the wheel may be eligible to be listed as a Key Threatening Process under the TSCA 1995. This nomination suggests that 4 macropod species are in trouble as a direct consequence of their gross mismanagement, at the hands of the OEH (satisfying Criterion 2). Consider that NPWS / EPA sit on their hands in NSW, and even provide approvals for longwalling projects, while coal mines subside swamps (actuating a key threatening process), impacting on endangered ecological communities (such as Newnes Plateau Shrub Swamps) and threatened species, such as the Blue Mountains Water Skink (Eulamprus leuraensis) and the Giant Dragonfly (Petalura gigantea). We see the OEH approve mines which destroy habitat for Squirrel Gliders (Petaurus norfolcensis), Brush-tailed Phascogales (Phascogale tapoatafa), the Common Planigale (Planigale maculata), Brown Treecreepers (Climacteris picumnus) and Grey-crowned Babbler (Pomatostomus temporalis temporalis), and threaten the habitat of others, such as the Giant Barred Frog (Mixophyes iteratus). While Goldney 2010 suggests impacts may not be significant, the recently approved Duralie Coal project affects all of these and other threatened species besides (habitat will be bulldozed slowly to protect threatened species). 2 or more threatened species in NSW are certainly affected by incompetent, negligent and ignorant decision making, on the part of departments responsible for approving and regulating development projects. On this basis it seems that the regulators being asleep at the wheel may meet Criterion 1 as well. This nomination raises but does not consider whether there may be undue influence on the regulators. For example “donations” to political parties could lead to ministerial interference, and “regulatory capture” is well known. The very formulation and administration of kangaroo policy may have been based on vested interests establishing improper and strategic partnerships, as was demonstrated to have happened in the timber industry (Regional Forest Agreement outcomes were heavily influenced by the forestry sector).